The 2012 running of the California Mille will take place April 29th to May 3rd over 1,000 miles of twisty back roads in California Gold Country, Lake Tahoe and historic Nevada. The 22nd annual running of the California Mille will begin Sunday, April 29th with a public car show at the Fairmont Hotel atop San Francisco’s Nob Hill, with 65 historic race cars on display from 11am to 6pm. 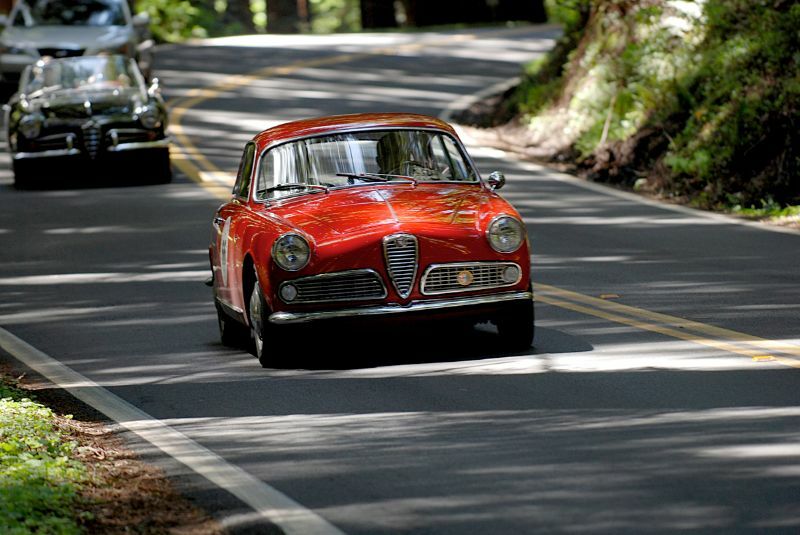 Participants depart at 8:30am the following morning for a four-day, 1000-mile adventure that will take them along little-known roads to picturesque towns, concluding at Solage Calistoga in Sonoma County on May 4th. Notable entrants in the 2012 California Mille include the 1956 OSCA MT-4; 1951 Ferrari 212 Export Sport; 1953 Siata 208S; 1957 Porsche Carrera GT; 1954 Talbot-Lago Gran Sport 4; 1954 Bentley R-Type Continental; 1957 Porsche Speedster; 1935 Lagonda Rapier; several Mercedes-Benz 300SL; Lancia B20 and B24; Alfa Romeo 1900CSS; among others. Around the Sports Car Digest office, the most interesting entrant is the 1947 Cisitalia 202 Gran Sport, since Publisher Jamie Doyle will be sharing driving duties with its owner. Sunday, April 29th – Approximately 65 historic race cars will be on public display in front of San Francisco’s Fairmont Hotel on Mason Street. Live Italian accordion music will help capture the Mille theme. Monday, April 30th – With the waving of the flag of Italy, the California Mille will depart for the Golden Gate Bridge, Rio Vista, Walnut Grove and a coffee stop in Locke. After a tour of the last rural Chinese town in America, the Mille will head for Lodi and lunch at the Wine and Roses restaurant. That afternoon, the Mille will take Highway 88 toward Sutter Creek, Lake Tahoe and the Hyatt Regency Hotel in Incline Village, Nevada, for an overnight stay. Tuesday, May 1st – The second day of the four-day drive will see the California Mille heading toward Emerald Bay and South Lake Tahoe, then traversing 395 toward Minden, with a choice of lunch at the celebrated JT Basque restaurant or the equally-celebrated Overland Bar & Basque restaurant in Gardnerville, Nevada. About 2pm, the Mille will zero their odometers and drive exactly 117.8 miles back to the Hyatt by way of Carson City, Virginia City, the National Motor Museum in Reno, and the Mt. Rose Highway to Incline Village. Wednesday, May 2nd – Departing northbound the Mille will join Highway 28 to 89 and Truckee, then to Nevada City for coffee and a stroll of the historic district. Highway 20 will take the cars toward Marysville, Sutter and Sacramento River-side park lunch in Colusa. The drive will continue via Williams and Middletown to the Silverado Trail, ending Day 3 at Solage Calistoga. Thursday, May 3rd – The final leg of the one-thousand-mile drive starts in Calistoga, follows Highway 128 to Geyersville, over two rusty bridges near the coast, down the spectacular coast on Highway 1 to Jenner with lunch at the Tides Restaurant in Bodega Bay. The coast highway will take the Mille to the Marshall-Petaluma Road, onto Hicks Valley Road, through Chileno Valley Road, into Petaluma, onto the Lakeville Highway, then straight to Solage Calistoga on Highways 116, 121 and 29. The California Mille will conclude its 22nd annual drive with an awards dinner at Solage.